One of the best things you can upgrade on a car is its speaker system. After all, you’re likely spending more time listening to your favorite tracks in the car than at home. It can be a little confusing to find out which type and model would fit, let alone sound good, though. If you know you’re dealing with standard pairs of 6×8 inch speakers, you’ll have a variety of replacement choices to pick from. Most will not only be designed to output clean and rich sound, they will perform better than older models. To help you search for a pair that’ll rock your ride, we offer this handpicked selection of the best 6×8 speakers. Here’s our picked group with some details and our ratings. 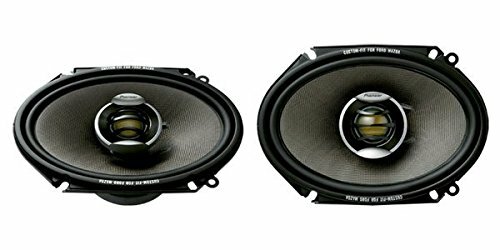 **Below, you'll find my more detailed reviews about the car speaker, but you can also click the links above to see current prices or read customer reviews on Amazon. We review each product here on their strengths and weaknesses. These models were chosen for outstanding sound quality as well as good value. Pioneer is a brand known for their quality audio gear, with features that outshine the rest for the price. These are great sounding and durable speakers that will please most music enthusiasts. Pioneer used a lot of advanced technology to engineer immaculate sound in a car speaker system. Each driver is capable of up to 60 watts of RMS output, and the comparatively high sensitivity of 88 dB will let these be driven by most stock head units. Each cone’s dual-layer construction of aramid fibers and natural basalt elements leads to a more rigid and absorbent composite surface. Bordered by a butyl rubber trim, the drivers remain stable and whole under most conditions. The silk dome tweeters with rear chambers deliver crisp highs, with waveguides to regulate the dispersal of sounds and broaden the sound stage. They are flush-mounted in thick metal baskets that lessen resonance and dampening effects, outputting crisp highs to round out the mid frequencies. The integrated -12dB per Octave LPF and HPF crossover enhances transitions for a smoother response in the mids. The punchy bass is clean rendered as well. Audio quality is generally superb with much detail and richness, although audiophiles might notice a few balance issues in the slightly recessed mid-range. Pioneer’s TS-D6802R delivers great quality for the money. This high performance combines with its advanced design and builds quality to make it our pick for an overall best 6x8 speaker. For buyers on a budget, this popular model is a good choice, especially if you don’t want to go overboard on a decent upgrade. Rockford has always made reasonably-priced aftermarket speakers, and these are no exception. The two-way drivers output 30 Watts RMS with hardly any distortion, even with heavy bass response on overproduced tracks. They output with a sensitivity of 87 dB, so are easy to drive with enough power reserve to handle any music genre. The integrated crossover works to produce powerful yet smoothly delivered sound with crisp and detailed highs. Lows are fine but not particularly clean or pronounced. With vacuum polypropylene cones surrounded by a butyl rubber compound trim, these are durable drivers. Silk dome tweeters are flush-mounted deliver. The assembly readily mounts in most 6x8 openings. 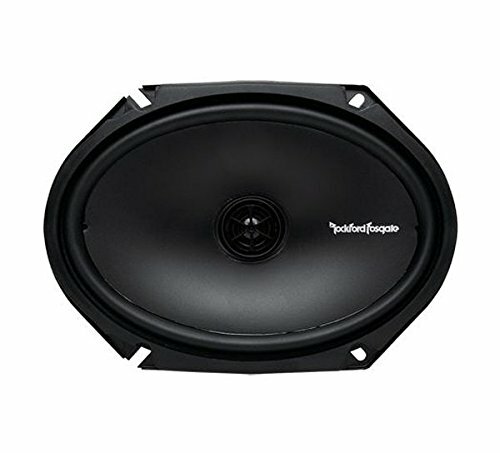 If you’re looking for an inexpensive upgraded of your existing speakers, you can’t go wrong with Rockford Fosgate’s R168X2 Prime 6 x 8 Inches Full Range Coaxial Speaker. It’s our budget choice for the best 6x8 speakers. You don’t need to spend much for a durable and efficient pair of speakers. This pair is an affordable example of a great budget design that will mount readily in most cars. These are reliable and nice sounding coaxial speakers that can serve as an easy upgrade for most factory units. Each is of capable of handling up to 75 watts of steady output power RMS, and the high sensitivity of 90 dB means these are easy to drive with stock head units. The tweeters have a good high-frequency response and performed well from the start. The highs are clear and detailed and blend smoothly with mid-range and vocal notes. The low end can use more power and depth, though. But the relatively even sound qualities does make it suitable for most genres. The baskets are designed to mount shallower than usual, making it easier for each to be fitted into the existing 6x8 cut-outs of most popular cars. In most cases, these units can be just dropped in as quick replacements for older speakers. 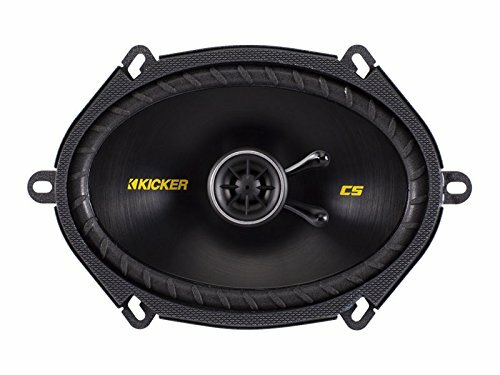 Kicker’s 40CS684 6x8 inch 2-Way Speakers may not be as detailed and more bass in their sound as pricier high-end models. But once installed, they can put on a fine performance for most listeners. Of the big audio brands, Alpine is known for its high-end systems used in premium car models, and this premium model delivers big. The audio is well-balanced and tweaked to offer the finest audio quality for all kinds of music. These powerful two-way speakers are capable of channeling a massive 200 Watts RMS per speaker, which can exceed the total output of most rival systems. This power combined with high 89 dB sensitivity means that you can level up with very little distortion. The well-balanced performance with its crisp highs, superior midrange, and a monstrous bass response is good for enjoying most genre music. For unamplified 6x8 units running on factory stereo systems, the amount of slam produced can be incredible. It’s obviously meant for bass lovers who like to listen to jumped up levels. The reason for the strong bass response is found in its cones’ construction, made of multiple layers of hybrid fibers. The surrounding rubber base is of HAMR Santoprene compound, which allows for extended and consistent movements. We were impressed with the crowd-pleasing performance, these speakers did not tire our ears after hours of listening. The silk tweeters feature an advanced ring-dome design with small but powerful neodymium magnets, for more exacting detail in the high ranges. Crossover circuits blend these into the mids in a lively but slightly overemphasized way that only audiophiles may notice. This is a nearly ideal if very pricey alternative for bass lovers, and a safe upgrade choice so long as your current head unit is up to supplying the wattage. 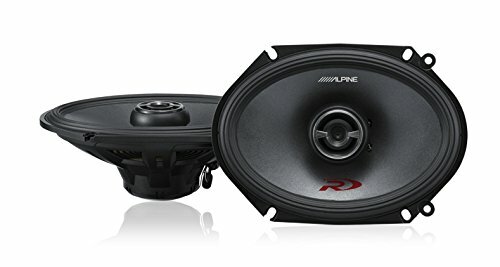 Alpine’s SPR-68 6x8" Coaxial 2-Way Type-R Speakers will get you that low-down sound on the streets. It’s our choice for the best 6x8 speakers that can do justice to your heaviest tracks. You should first figure out what’s available within your budget that matches your car’s existing head unit, then select the best 6×8 car speakers that meet your needs. On-line research and shopping can really pay off, as with this buyer’s guide. The best 6x8 car speakers produce clean and detailed treble with rich and full-bodied vocals and instruments. Everything should smoothly and spaciously blend into low notes and deeper bass that doesn’t sound weak or muddy. The ability to handle large air volumes brings punch and verve in the low frequencies of bass-heavy tracks. This can be improved by adding of dedicated amps for each channel since such setups usually generate less distortion. This is the level of power in Watts that a speaker driver can handle, in peak and steady (RMS) modes. If the car’s existing head unit is a usual factory type with low output power in 4-5 channels, It would make sense to buy a speaker set with low to average wattage. Anything with higher power capacity will not be able to utilize it all, anyway. On the other hand, you might be upgrading vehicles with powerful audio systems fed by multiple amplifier stages. In such cases, it’s best to consider premium 6x8 speakers that match or slightly exceed the power specifications of the existing speaker pairs. A standard volume measure of how efficiently the speakers’ drivers can output sound. Depending on the driver and crossover design, stereo head units that output 20 Watts RMS output or less per channel should be carefully paired with high-efficiency speakers. Such stereos are usually a good match for 6×8 two-way speakers that feature high sensitivities of at least 90 dB or higher. Then again, efficient speakers driven to loud levels will manifest less desirable sound artifacts in tracks with questionable production values. This is the breadth of the audio spectrum that a speaker’s drivers can reproduce. The broader the range, the better the design. The better ones convey ranges from highs near 20 KHz down to around 20 Hz. In practice, standard coaxial speakers don’t do much below 80 Hz, which subwoofers handle well. The built-in crossovers of these designs balance all these outputs in a pleasing manner. The dynamic coil designs covered here rely on two drivers (two-way) that align in one direction (coaxially). The tweeter reproduces the high and mid frequencies, while the main full-spectrum driver handles the mid- to low-range notes channeled to it by the crossover circuits. Component loudspeakers are individual drivers that reproduce frequencies within their design range. Unlike integrated coaxial speakers, these come as sets of two to four specialized drivers that render the full audible spectrum together. Crossovers and wiring: These work along with waveguides to channel and mix the drivers’ mid-frequencies outputs. This results in a smoother and richer presence as well as more spacious-feeling imaging. You may have to get terminal adapters and other connectors according to factory specs, to fit replacement speakers to certain cars. If you’re handy with electronics, you can install a high-band filter to clip the bass frequencies of stock head units for clearer performance at higher volumes. An infor﻿mative art﻿icle on car stereo upgrades. You can choose from our selection with confidence, knowing that they’ll sound good once mounted into your current setup. With its proven overall performance, we think that Pioneer’s TSD6802R 6 X 8 2-Way models are the best 6x8 speakers to upgrade your car’s audio system with. Alpine SPR-68 6x8" Coaxial 2-Way Speaker are the business for loud, bass-heavy listening. It’s our pick for pounding experiences on the street and is simply the best 6x8 speakers for bass. Any of these speakers, when paired with an audio system of matching wattage and source quality, should be able to bring out the music in your daily drives. If you liked this article, feel free to comment and tell us what you think of our reviews of the best 6x8 speakers.